Most astronomers would agree that the age of the Universe - the time elapsed since the "Big Bang" - is one of the "holy grails of cosmology". Despite great efforts during recent years, the various estimates of this basic number have resulted in rather diverse values. When derived from current cosmological models, it depends on a number of theoretical assumptions that are not very well constrained by the incomplete available observational data. At present, a value in the range of 10-16 billion years  is considered most likely. But now, an international team of astronomers  has used the powerful ESO Very Large Telescope (VLT) and its very efficient spectrograph UVES to perform a unique measurement that paves the way for a new and more accurate determination of the age of the Universe. They measured for the first time the amount of the radioactive isotope Uranium-238 in a star that was born when the Milky Way, the galaxy in which we live, was still forming. It is the first measurement ever of uranium outside the Solar System. This method works in a way similar to the well-known Carbon-14 dating in archaeology, but over much longer times. Ever since the star was born, the Uranium "clock" has ticked away over the eons, unaffected by the turbulent history of the Milky Way. It now reads 12.5 billion years . Since the star obviously cannot be older than the Universe, it means that the Universe must be older than that . Although the stated uncertainty is still about 25% or about ±3 billion years, this is only to a minor extent due to the astronomical observation. The main problem is the current absence of accurate knowledge of some of the basic atomic and nuclear properties of the elements involved. However, further laboratory work will greatly improve this situation and a more accurate value for the age of the star and implicitly, for the Universe, should therefore be forthcoming before long. This important result is reported in the international research journal Nature in the issue of February 8, 2001. This leaves only two possible isotopes for astronomical measurements, thorium (232 Th or Thorium-232, with a half-life of 14.05 billion years ) and uranium (238 U or Uranium-238, half-life 4.47 billion years). 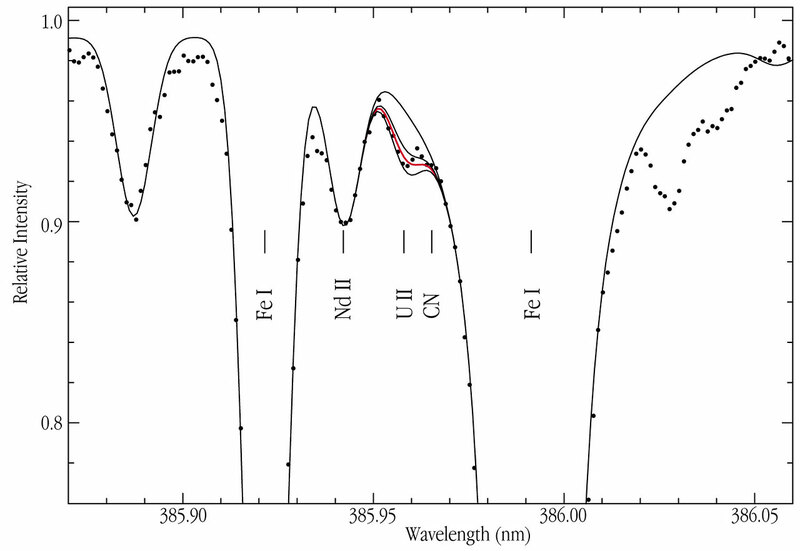 While only one or at most two thorium lines have ever been measured in any other stars, no less than 14 thorium lines are seen in the spectrum of CS 31082-001. Indeed, there is such a wealth of lines of other rare and precious metals that this spectrum is a real astronomers' treasure box. And best of all, the long sought-after line of singly ionized uranium is clearly detected at its rest wavelength of 389.59 nm in the near-ultraviolet region of the spectrum! Different models of the element production in supernova explosions predict somewhat different production ratios between the stable and radioactive isotopes, leading to age estimates for this star in the range 11-16 billion years. 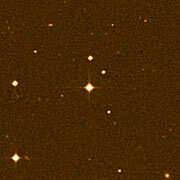 The most likely age of CS 31082-001 is 12.5 billion years . The team members are: Roger Cayrel (P.I. ), Francois Spite and Monique Spite (all Observatoire de Paris, France), Vanessa Hill and Francesca Primas (ESO), Johannes Andersen and Birgitta Nordström (Copenhagen and Lund Observatories, Denmark and Sweden), Timothy C. Beers (Michigan State Univ., USA), Piercarlo Bonifacio and Paolo Molaro (Trieste, Italy), Bertrand Plez (Montpellier, France), and Beatriz Barbuy (Univ. of Sao Paulo, Brazil). Isotopes of a natural element contain different numbers of neutrons in the nuclei, in addition to a certain number of protons that characterize that particular element. Some isotopes are "radioactive", i.e. with time they are transformed into other elements or isotopes. Other isotopes are stable over exceedingly long periods of time. Uranium-238 contains 92 protons and 146 neutrons. The "half-life" of an isotope indicates the time after which half the atoms have decayed. After another time interval of this length has passed, only 25% of the original isotope is left, etc. 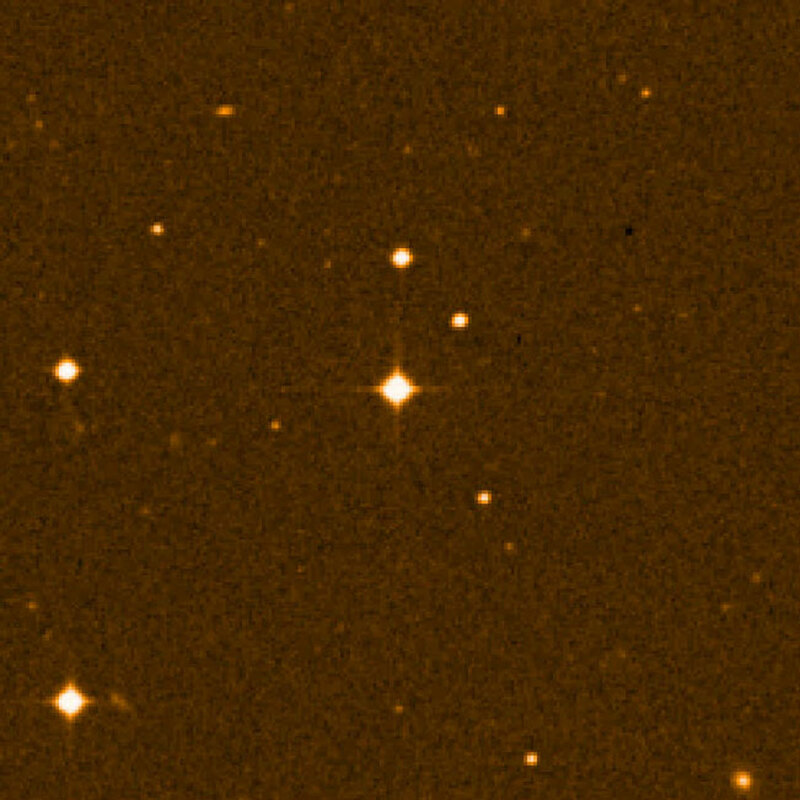 As the iron abundance in CS 31082-001 is only 0.12% (1/800) of that in the Sun, this means that, relative to iron and similar, lighter elements, the heaviest elements in that star are approximately 100 times "overabundant". Their spectral lines, again in relative terms, are correspondingly stronger - this is of crucial importance for the present, difficult measurements. ESO Press Photo eso0106 is reproduced from the STScI Digitized Sky Survey (© 1993, 1994, AURA, Inc. - original plate material by Royal Observatory Edinburgh and the Anglo-Australian Observatory - All Rights Reserved) and based on blue-sensitive photographic data obtained using the UK Schmidt Telescope at Siding Spring (Australia). The comparatively empty sky field is located at high southern (-76°) galactic latitude and measures 7 x 7 arcmin 2 and. ESO Press Photo eso0106 is reproduced from a spectrum of CS 31082-001, obtained in October 2000 with the UVES high-dispersion spectrograph at the VLT 8.2-m KUEYEN telescope at Paranal. The exposure lasted 4 hours, at a spectral resolution of approx. 75,000 and with a S/N-ratio of about 300. The lines are identified and three synthetic spectra, with different U-abundances, are drawn to illustrate the fit.